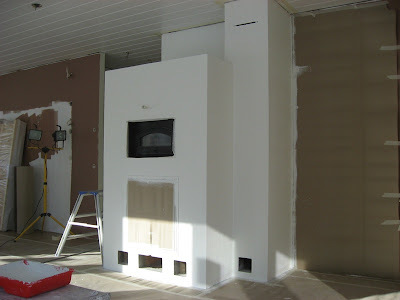 On Day 46 (16th March), it was time for the final coats of paint for the fire place. First the whole thing was painted in an off-white colour ("Damasti"). This had to be applied twice, some three hours apart. The photo above shows the first coat of paint. Finally, in the evening, the firewall part above the fireplace was painted in the same brown tone as the wall on the other side of the chimney ("Etruski"), and this was repeated by a second coat of brown on Sunday morning (Day 47, 17th March). 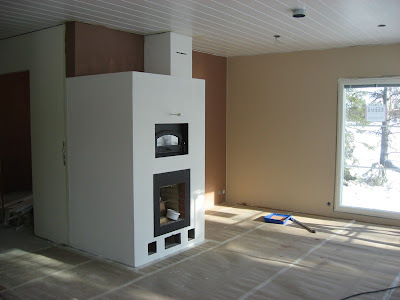 The photo shows the final product, the fireplace stands out nicely against the contrast of the dark wall. Since the weather was just brilliant, there was a chance and time to play with the extreme wide-angle GoPro camera. 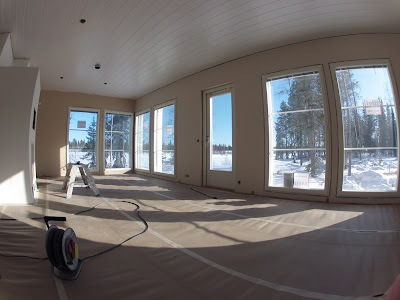 Above is a shot that would be hard to achieve with other cameras, a view that shows all kitchen/living room windows and the terrace door at once. 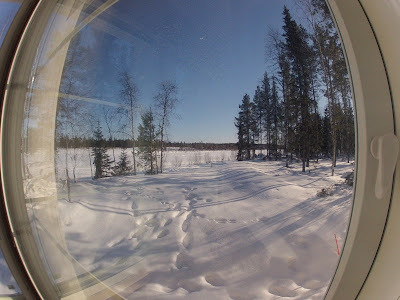 No, our windows are actually perfectly straight, but when going very close to the window with the GoPro, the extreme wide angle distorts the window frame. A nice view in any case. Thomas, take off the sticky ad papers from outside of the windows, cos the sun dries the glue with time and it just won't come off nicely. At least that was my experience last Fall... :/ -Daniel.